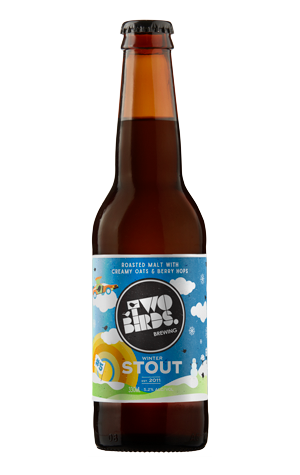 Now they have their own bottling line in house, Two Birds Brewing has greater freedom with its lineup. So, starting now, the plan is to release a seasonal beer in bottles every three months as a rotating fifth member of the lineup (alongside Golden, Sunset, Taco and Pale). First up is the Winter Stout, tapped initially at the Two Birds Nest but spreading its wings far further afield. It's another that makes use of the brewers' fondness for adding oats to the mix, here with the intention of creating "a creamy mouthfeel" and to "warm you from the inside out". Described by the Birds as "Dark and brooding, like chilly winter nights", in less poetic terms that translates to: "Delicately roasty with a subtle bitterness and dark berry hop notes."